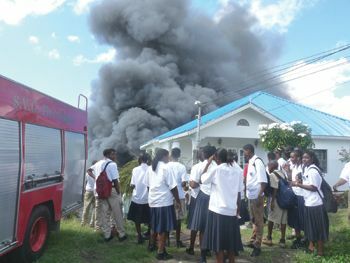 The Fire, which broke out around 12 midday, burnt through an abandoned wooden structure at Mckieâs Hill. Fortunately, no one was in the house at the time. When Searchlight arrived on the scene, students of the IHS were scattered around the burning house, obviously excited by the flames and the thick black smoke that clouded the air. They were, however, cautioned by their teachers to get back to where they would be safe.